WYSE Travel Confederation is committed to understanding the ever-changing characteristics, motivations, and needs of young travellers. By gathering and analysing market intelligence, WYSE Travel Confederation helps organisations understand the unique and fast-changing travel interests of the millennial and generation z markets. We invite you to learn more about youth and student travel by reading WYSE Travel Confederation’s research publications. “Youth travel has become one of the fastest growing segments of international tourism, representing more than 23% of the over one billion tourists travelling internationally each year. This growth represents tremendous socioeconomic opportunities for local communities as youth travellers stimulate local tourism businesses, foster closer social interaction with host populations and champion environmental protection. Young people, recognised by the United Nations as a major force for development and social change, have the potential to drive sustainable development in the tourism sector. Most of the young travellers (15 to 29) of today come from two generational cohorts: generation Y, born between the early 1980s and 2000 and better known as “millennials,” and generation Z, born after 2000. Roughly 50% of millennial and gen Z travellers are travelling for the purpose of holidays, but the other 50% are undertaking experiential travel such as work abroad, language study, higher education, au pairing, and volunteering. These experiential youth travellers generally stay longer and spend more. Research by WYSE Travel Confederation and UNWTO indicated that the total value of the international youth travel market was almost USD 190 billion in 2009. By 2017 that figure had risen to more than USD 280 billion. 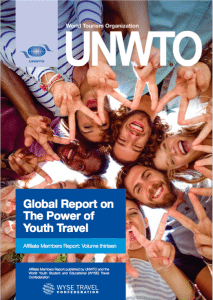 Based on UNWTO forecasts for global tourism growth, we can estimate that by 2020 almost 370 million youth travellers will account for a total spend of over USD 400 billion. Young people are often money poor, but time rich, which means that they can spend longer in a destination than a typical tourist. The WYSE Travel Confederation Millennial Traveller research in 2014 indicated that young travellers spent an average total of USD 2,160 (EUR 1,591) on their main trip. This compares with an average of USD 1,097 (EUR 950) per trip for international tourists as a whole in 2013. Because young people often take much longer trips than most other tourists, young people are spending up to two thirds more on average. One secret to leveraging the greater spending power of young travellers is tapping into the resources of their parents (often struggling with the opposite time-money dynamic). The WYSE Travel Confederation New Horizons survey has shown that just under a quarter of young travellers’ expenditure tends to financed by family and friends. Another secret is for destinations to enable young travellers to work in order to earn additional money during their travels. The high value of youth travel also lies in the ‘lifetime value’ that young people deliver to destinations over the course of their travel career. Travellers often return to the places they visited earlier in life. In Australia, the 2011 ATB study Backpackers Uncovered indicated that 58% of backpackers would be likely or very likely to return in the next five years. When the going gets tough, the young travel – and keep travelling. Young travellers are relatively intrepid and less likely to be phased by economic problems, political unrest or health epidemics. A WYSE Travel Confederation survey of youth travellers’ opinions on the 2014 Ebola outbreak indicated that this global health scare had little impact on their travel plans. Research by Tourism Australia indicated that two thirds of backpackers visiting the country in 2011 were impacted by the strong Australian dollar, however, overall backpacking trip lengths were not significantly altered. There is also evidence to suggest that young people are stimulated to take longer trips when the economy is poor; if there are fewer job openings, young people consider taking a gap year or gaining some work experience abroad until the economy picks up again. Young professionals may opt to engage in what has been termed ‘funemployment’ – using redundancy money or savings to refresh their perspective on things until new job opportunities become apparent. The overall picture is that youth markets tend to be less volatile than the tourism market as a whole. Figures from the WYSE Youth Travel Industry Monitor of 2009 and 2010 indicated that although the youth travel sector was affected by the global financial crisis, it had declined less and recovered faster than mainstream tourism. Because young people travel for longer periods, they also tend to spend a greater proportion of their total budget in the destination. WYSE research indicates that around 60% of youth travel budgets are spent in the destination. In some cases, the proportion is even higher. Research by Tourism Australia indicates that backpackers spent 68% of their total travel budget in Australia in 2008. The Millennial Traveller Survey conducted by WYSE Travel Confederation in 2014 showed that the most important motivations for young travellers are to interact with local people (55% rated as important) and experience everyday life in another country (45%). This drive to experience the ‘local’ while travelling brings young travellers closer to local communities and means that they have more direct economic, social and cultural impacts on the communities they visit. The tendency of young travellers to seek out local suppliers also reduces economic leakage and drives more expenditure towards local businesses. This can have wide ranging positive effects for destinations. For example, Rodrigues and Prideaux (2011) found that backpacker tourism in the Amazon region of Brazil generated significant local employment opportunities, as well as sociocultural benefits and important conservation outcomes, including a reduction in logging thanks to increased tourism income. A clear trend in the youth travel market has been a shift from leisure travel towards purpose-drive travel, such as work and study abroad, volunteer travel and language learning travel. These more active, purposeful forms of travel are geared towards personal development, and can also have positive impacts on the destination. Development Through Volunteering Overseas, a WYSE Travel Confederation study in 2015, indicated that over 80% of young volunteer travellers felt that their host family, host organisation, or friends in the host country had also benefited from their contribution as a volunteer. Young people often travel to study or gain work experience. Student travel is now being recognised as an increasingly important economic driver. The mobile and flexible workforce of young travellers is becoming almost irreplaceable in some parts of the world. In 2014 the Australian overseas student industry contributed AUD 17 billion in export income to the Australian economy, according to Australian Education International (AEI). This is a 17.3% increase on calendar year 2012 (AUD 14.5 billion). International education activity contributed an estimated AUD 15 billion to Australia’s economy in 2013 – a 3.8% increase over 2012, but still shy of the previous high of AUD 16.1 billion in 2010 (ICEF Monitor, 2014). UK international students are estimated to generate around GBP 17.5 billion for the UK economy, and support almost 22,000 full time equivalent jobs outside higher education. Around GBP 4.5 billion is spent directly with universities themselves. The education market is expected to grow in future as well, with the British Council estimating that the total number of students enrolling in higher education worldwide, including those studying in their home country, will increase by 21 million between 2011 and 2020 from 178 million to 199 million- with continued growth in emerging markets (HM Government, 2013). Global demographic change and rising incomes in developing countries are likely to increase the number of internationally mobile students. In the USA, the 886,052 international students and their families at universities and colleges supported 340,000 jobs and contributed USD 26.8 billion to the American economy during the 2013-2014 academic year (NAFSA, 2014). This represented a 8.5% increase in job support and creation and a nearly 12% increase in economic contribution compared with the previous academic year. Arguably, the money that educational institutions earn from international students makes a valuable contribution to the educational system as a whole, allowing the host country to support facilities that it would often not be able to afford otherwise (NAFSA, 2014). In addition to spending money which supports employment in tourism and other industries, young travellers often work themselves while travelling. The number of working holidaymakers (WHMs) has increased significantly in recent years to key destinations such as Australia and New Zealand. In Australia working holiday visas (WHVs) grew from 185,480 in 2010-11 to 214,644 in 2011-12 to 249,231 in 2012-13, an increase of over a third in three years. This has sparked a national debate about the costs and benefits of working holidays, which are feared will take jobs from locals. Such fears have prompted the federal government to raise the tax rate for working visitors in Australia. The measure will take effect from July 2016 and is expected to generate AUD 540 million in revenue by 2019. Tan and Lester (2012) found that every 100 working holidaymakers created five net full time jobs in Australia, confirming earlier research (2008) showing that WHMs generated a total of 28,000 jobs- 8,000 more jobs than the jobs they themselves occupied. The jobs that working holidaymakers take are often difficult to fill with the local workforce, particularly in rural areas. Furthermore, in the globalising economy, the attraction of talent is increasingly being seen as a key factor in economic competitiveness. Destinations that enable youth travel attract the talent of young professionals, introducing young people to places they may want to re-locate to and contribute to developing work-related skills. WHM research in 2015 indicated that 59% saw working overseas as beneficial for their personal development and 52% saw working overseas as beneficial for their career. Young people also add atmosphere and ‘buzz’ to destinations, attracting other visitors and businesses. This effect has been recognised in many cities across the world and there are growing numbers of projects to relocate university facilities in city centres to act as hubs for cultural and creative activities. The provision of student accommodation is often also an important feature of such schemes.